DECK THE HOLIDAY'S: MEDIEVEL WEEK FROM GOTLAND, SWEDEN! MEDIEVEL WEEK FROM GOTLAND, SWEDEN! During eight days in August the Middle Age is back. Gotland’s special settings, Visby’s 200 medieval houses on winding lanes, splendid church ruins, and the magnificent city wall frame a spectacle without equal. Markets and music, theater and lectures. Knights clash in tournaments. Medieval Week leaves no one unaffected. It is an unforgettable journey in time and space. 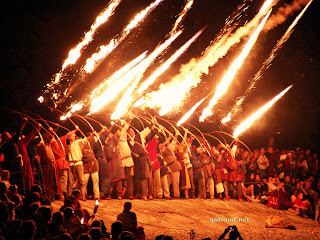 Experience Medieval Week on Gotland. Discover history. 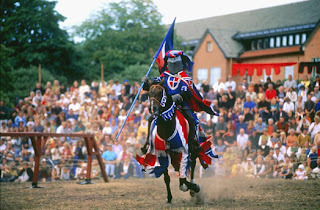 Medieval Week 2011 takes place August 7th - 14th. Gotland, Sweden’s largest island, lies right in the middle of the Baltic. Its population is 58.000, a figure that doubles many times over during the summer, as Gotland is a much-loved destination for holidaymakers. The island’s biggest city, Visby, boasts one of the best preserved medieval ramparts anywhere in the world. 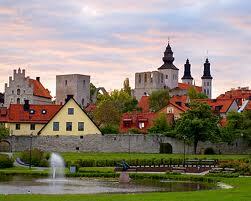 Not surprisingly, Visby has been on UNESCO’s world heritage list since 1995. It also has more restaurants per capita than just about any city in Sweden, offering a wide range of culinary delights. The countryside, with its woodlands, bleak heaths and flowering meadows, is richly varied and hauntingly beautiful. Here, you’ll also find more than 90 medieval churches, ancient remains from the Viking period and any number of top-quality crafts studios. Along the almost 800 km coastline, gently shelving sandy beaches alternate with shingle shores and seaside meadows. The climate is mild, with many hours of sunshine and pleasantly warm autumns. What is the Medieval Week? The Medieval Week is arranged annually on Gotland in the beginning of August. In the year of 2010 it will be held from Sunday the 8th to Sunday the 15th of August. Every year during one week in August, we blow life into history. The Medieval market gets into life in Gotlandsänget and Paviljongsplan, where stonemasons and smiths work alongside the clattering of horses’ hooves and bleating sheep. 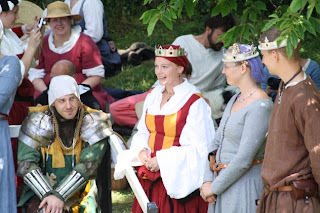 A week filled with colour and events, including music, pageants and jousting tournaments. A huge variety of lectures and study courses are also held. A mixture of sobriety and merriment, education and festivities. The Medieval Week incorporates music, dance and theatre performed by many different artists and groups. You will find hair-raising mystery plays and amusing farces. There are guided walks around the Medieval town and its wall. You can walk around herb gardens or along the shore. There are many opportunities to learn more about the Middle Ages through a wide variety of courses, including Medieval crafts of various kinds, song and music, runes or even juggling, as well as the chance to attend various lectures. One of the highlights of the week is the Jousting Tournament. This spectacle brings to life the atmosphere of a Medieval tournament, where knights on horseback joust. 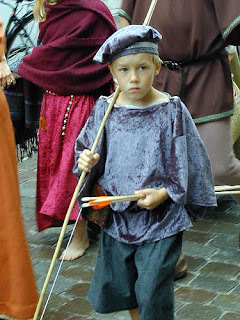 You will also find a royal presence, archers, combatants, acrobats and Medieval markets. 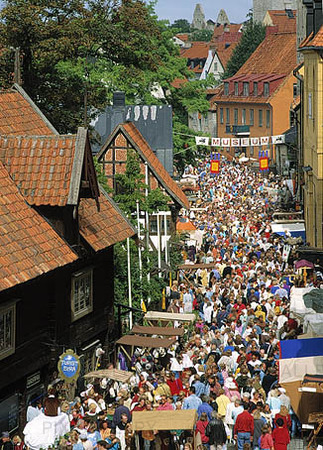 These tournaments have proved to be so popular that some are held as early as July, in Visby and in the countryside. A large number of other events of the Week also take place outside Visby in churches, museums etc. 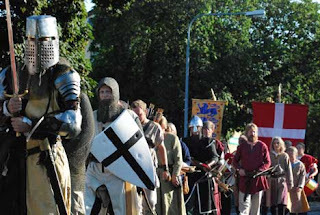 Medieval Week on Gotland is well-known by many. We can hear professional men and women refer to Medieval Week in radio programs, we can read about Gotland and Medieval Week in books and magazines. A couple of doctoral theses cover Medieval Week and its activities. By how many know what Medeltidsveckan looks like from behind and how it is organized. Medeltidsveckan is run by an independent foundation with a small office at its disposal. Here a few dedicated persons work all year around to make sure that week 32 on Gotland becomes an experience to remember and to take home. The foundation was founded in 1994 by six founders: Gotlands kommun, Gotlands Fornvänner, Gotlands Turistförening, Gotlands Hembygdsförbund, Gotlands Bildningsförbund and Medeltidsgillet på Gotland. As important as the office that keeps Medieval Week together, are all the persons who volunteer before and during week 32. They are the reason this special week takes place. It is also the associations and companies that make it possible for the little extras to work. 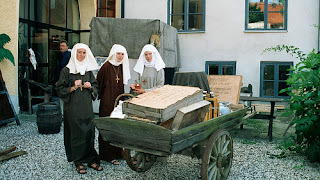 Something you learn when you have participated in Medieval Week over a few years is that there many things that have to fit in order for it all to function. Even the implementation of the smallest detail is a condition for the whole arrangement to be a success. Let’s go back to the summer of 1361 when Visby still was a powerful Hanseatic town with a surrounding wall, wealthy churches, monasteries and chapels. Warehouses with their stepped gables were clustered tightly along the main street Strandgatan, filled with luxurious goods brought by ship from far off countries. The streets and alleys were thronged with merchants, monks, servant girls, journeymen and beggars. Gotland belonged to Sweden which was at that time ruled by Magnus Eriksson. However, the island gave a strong impression of being its own realm, where there was distinct antagonism between the townspeople and the wealthy farmers. Valdemar Atterdag ruled Denmark. King Magnus was forced to cede the provinces Blekinge, Skåne and Halland in 1360. The large islands Gotland and Öland were also threatened. King Valdemar and his army landed on the west coast of Gotland on July 22, 1361. The Gotlandic farmers defended themselves bravely, but were finally overthrown in the great battle outside the gates of Visby, where 2000 men fell. The townspeople passively witnessed the farmers’ downfall. In exchange for Valdemar’s promise to retain its privileges, the town capitulated and opened its gates.The Coat of Arms of Medieval WeekThe Medieval Week’s coat of arms was developed in 2005 and is today used for symbolism at ceremonial occasions. The heraldic symbolism of the coat of arms represents Medieval Week and Gotland at the same time. The two-part shield exemplifies the countryside and the city on Gotland, and also the connection between the two. Red and white are the colors of Gotland. The left part of the shield is adorned by a ram which has been recognized and acknowledged as the symbol of Gotland since medieval times. The numerous yellow crosses represent all the churches found on Gotland that through history have had so much importance for both city and countryside. The rose coat of arms on the right is inspired by Peder Harding’s coat of arms (Peter Harding was the Gotlandic chief who led the people of the countryside in the civil war of 1288). In addition the rose is the flower that symbolizes and is associated with Gotland, and especially with Visby. The coat of arms is designed by the heraldist Veljo Pärli. What entices thousands of visitors to come to Gotland and dress in medieval clothing? Young and old travel back 1000 years and live in the Medieval Age for a whole week on Gotland. Is the interest for this distant time period really serious or do we have a wish to escape from the present for a while, to dress in something foreign or different? To become a different person and fantasize about how life would have been for people in various situations, occupations and social connections. 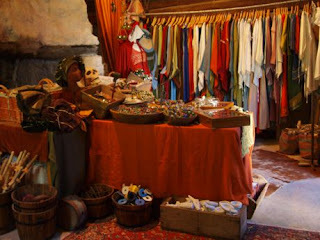 Medieval Week is carried out with high quality demands. All events shall be perceived as medieval and genuine, while the artistic creation of today also shall be found on the program – historical science and contemporary creativity in close association seems ideal to us! I am passionate about Halloween and Christmas. Many nights spent in the lab making and creating new props and decorations. I have been married for 25 years and have teenage twins (a boy and girl). I like 80's rock, all kinds of sports,thriller and action movies. I also moonlight as a pastry chef/baker. TOP 10 HORRIFYING MONSTERS IN LITERATURE!